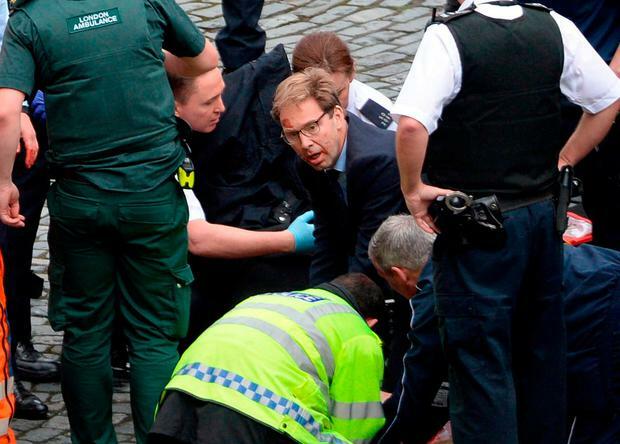 Foreign minister Tobias Ellwood was praised as an "absolute hero" after he tried to save the life of the policeman stabbed during the attack on the British parliament. The Conservative MP attempted mouth-to-mouth resuscitation and applied pressure on the wounds to stem the blood flow to keep him alive. Mr Ellwood, a former captain in the Royal Green Jackets, attended the victim as he waited for medical staff and an air ambulance to arrive in Parliament Square. He was later seen with bloodied hands talking to police officers near the scene before going back to the Foreign Office. A source close to Mr Ellwood said: "[He] tried to give mouth to mouth and stem blood flow from multiple stab wounds to the officer until the chopper and medics arrived." There were reports last night that Mr Ellwood "ran in [the] opposite direction to everyone else, he ran towards the injured police officer". Photographs later emerged of Mr Ellwood, dressed in a blue suit, helping medical staff and policemen treat the officer, who later died. A source close to the MP said last night he was "well but shaken". Mr Ellwood, MP for Bournemouth East, has been Parliamentary Under-Secretary at the Foreign Office since July 2014, covering the Middle East and Africa brief. He lost his brother Jon in the Bali terror attack in October 2002, which killed 202 people including 27 Britons. Mr Ellwood has previously talked about the difficulty in getting the body of Jon, who was a teacher, back after the attack. MPs from across the political spectrum last night praised him as a "hero".